FAYETTEVILLE, Ark. – After posting a successful outdoor season, two members of the No. 5 University of Arkansas men’s track and field team have earned conference honors. 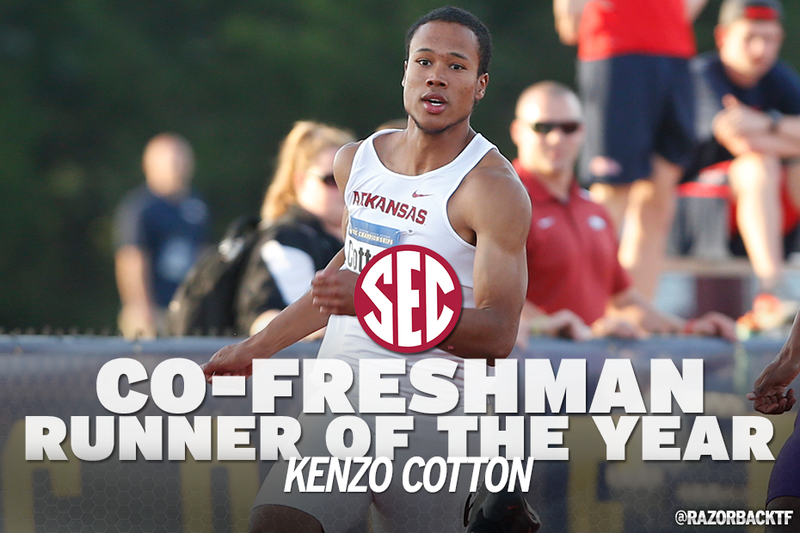 Kenzo Cotton has been named the SEC Co-Freshman Runner of the Year while Nathanael Franks is the Scholar Athlete of the Year as announced Tuesday by the league office. Both Cotton and Franks finished in the top five at the SEC Championships at 200 meters and decathlon, respectively, with season-best marks. This is the third-consecutive scholar-athlete honor for Franks as he was the recipient of the award in 2013 and 2014. Franks, who is currently pursuing his second master’s degree in accounting, having earned his first in May 2014 was also the first Arkansas male student-athlete to win the prestigious SEC H. Boyd McWhorter Scholar-Athlete of the Year. He is also a finalist for the NCAA’s Walter Byers Postgraduate Scholarship and was a finalist for the Rhodes Scholarship. At the conference meet, Franks finished fourth in the decathlon with 7,343 points, a score secured an NCAA qualifier. Cotton is the third Razorback in program history to earn SEC Freshman of the Year accolades, joining the likes of teammate Omar McLeod who earned the honor last year and former standout Wallace Spearmon, Jr. (2004). In his last outing, Cotton with the combined efforts of McLeod, Marqueze Washington and Jarrion Lawson posted the fastest 4×100-meter relay in the NCAA with a school-record 38.66. He also qualified for the national meet with the same foursome in the 4×400-meter relay. At the SEC meet, Cotton accounted for nine points including fifth-place finishes at 200 meter and in the 4×100-meter relay. Looking forward to next week’s NCAA Championships, the Razorbacks have a total of 10 national qualifiers in 10 events. In addition to Cotton and Franks, other Razorbacks represented include Kemoy Campbell at 5,000 meters, Stanley Kebenei in the 3,000-meter steeplechase, Lawson in the long jump and 100 meters, Ken LeGassey in the high jump, McLeod in the 110-meter hurdles, Clive Pullen in the triple jump and Washington in the 4×100- and 4×400-meter relays.